ARLINGTON, Va. – The Arlington County Board today approved a plan to demolish a block-long, outdated and vacant office building in the heart of Crystal City and replace it with a Class-A, 24-story office building with ground floor retail and a half-acre interim park. The Board voted 4 to 1 to approve a framework Block Plan on Crystal Drive between 18th and 20th Streets. The Block Plan lays out a transformational vision and site plan for the site, the first such project since the County adopted the Crystal City Sector Plan in 2010. 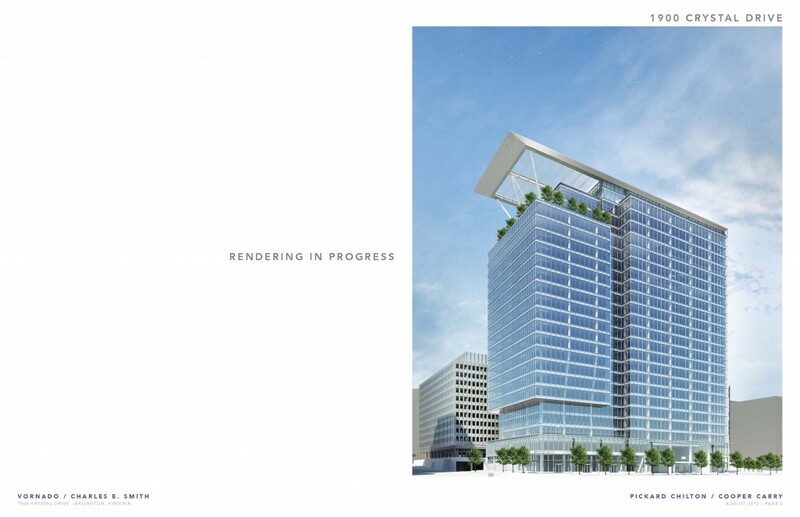 When completed, 1900 Crystal Drive will be the tallest building in Crystal City, featuring 719,704 square feet of office space above 11,290 square feet of ground floor retail. The site also will include a temporary park on Crystal Drive. Under the County’s Affordable Housing Ordinance, the developer, Vornado/Charles E. Smith, will contribute $3 million to the County’s Affordable Housing fund and another $7 million in community benefits. In today’s challenging economic environment, the County views this project, and the planned Route 1 streetcar, as an important first step to spur redevelopment of one of Arlington’s most successful urban villages in a post-BRAC (Base Realignment and Closure) environment. As a result of BRAC, several government agencies have already moved out of Crystal City offices and still more are scheduled to leave the neighborhood in the next several years. The County adopted the Crystal City Sector Plan to help ensure that these vacancies become an opportunity for the community to create a more walkable, transit-oriented Crystal City with better open space, more mixed-use buildings, more ground-floor retail and more housing. The proposed development is located at 1851 S. Bell St. (renamed 1900 Crystal Drive), near the Crystal City Metro Station. It is the first major site plan proposal to be considered for the area since the 2010 adoption of the Crystal City Sector Plan. The redevelopment will orient the building with main entrances from both Crystal Dive and the central courtyard area of the block. A half-acre interim park will be built in the northeast portion of the block that currently serves as a surface parking and loading area, adding vibrancy to that part of the block, which is the future site of a building per the Block Plan. The park will provide a permanent grand staircase and elevator to make it easy for Crystal City denizens to walk to the park or to the interior of the block from Crystal Drive. In addition, within the next 18 months, the applicant will be working with staff to prepare an implementation plan for guiding the achievement of Center Park, which is a major open space amenity envisioned for this block by the Crystal City Sector Plan. The Board asked that the plan be reviewed by the Crystal City Citizens’ Review Council before being adopted by the County Manager. A five-level parking structure with 732 spaces will be built with connections to the existing garage that serves the office buildings on the block, along with the creation of 14 on-street bicycle parking spaces primarily along Crystal Drive, 28 bicycle parking spaces in the existing courtyard central to the block and 100 secure bicycle parking spaces in the garage for use by the buildings employees and visitors. Public parking is available weekday evenings after 6:00 p.m., on weekends, and all legal holidays until the close of business. The Board gave the Manager flexibility to consider deviating from the adopted County sidewalk standard for 1900 Crystal Dive if it could be demonstrated that any alternate paving method provided a well-marked clear zone and met accessibility standards. Any such alternatives would be presented to the County’s Disability Advisory Commission and the Pedestrian Committee for review and comment prior to the Manager granting permission for its use. As part of the County’s green building initiative, the new office building will be designed to achieve LEED Gold certification with 20 percent energy savings. Office buildings use enormous amounts of energy for cooling and heating, one of the green features will be the installation of a more efficient four-pipe hydronic heating and cooling system. The system will permit connection to a future district energy utility. The site is in Crystal City. Since there are no formal neighborhood associations representing the area, County staff reached out to the Crystal Park Condominium building, Crystal City Resident Community, Aurora Highlands Civic Association and Arlington Ridge Civic Association on the project. Representatives of these organizations participated in four meetings with the Planning Commission Site Plan Review Committee (SPRC) and the one joint meeting with the Long Range Planning Committee (LRPC). In addition, the site plan was evaluated against a community amenity inventory developed by the Crystal City Citizens’ Review Council and County staff. To learn more about this planned project, visit the County website. Scroll down to Item 40 on the County Board Agenda to read the staff report. The 1900 Crystal Drive project is the first significant redevelopment proposal for a Crystal City property since the County Board adopted the Crystal City Sector Plan in 2010. The 40-year long-range plan is a shared vision of the residents, businesses, the County and other stakeholders to transform the area by encouraging new development through density and other incentives, improving the streets, sidewalks and other infrastructure, upgrading open space and increasing transit options. The goal is to make Crystal City a more inviting, lively and walkable community with more ground floor retail, better quality office space and more housing options. The County initiated the Crystal City Sector Plan in response to the federal government’s Base Realignment and Closure Commission (BRAC), which had a major impact on Crystal City as various Department of Defense-related agencies moved out of the area; leaving millions of square feet of office vacant and causing the loss of thousands of jobs in Arlington. o CESC Mall Land L.L.C. o 1851 S. Bell St. (to be renamed 1900 Crystal Drive); on Crystal Drive between 18th St. S. and 20th St. S.